Sedans may be a dying breed in the United States but it seems like no one informed Mercedes. 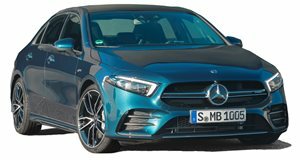 In the past two weeks, the German automaker has unveiled not one but two all-new AMG-branded performance sedans based on the same platform. 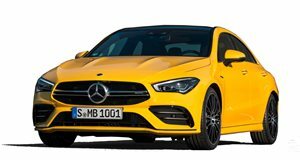 The A35 AMG is a traditional sedan meant to rival the Audi S3 while the CLA35 AMG is what Mercedes calls a four-door-coupe (basically a sedan with a sloping roof). Four-door-coupe models like the Volkswagen CC and the original Mercedes CLS are good looking cars but there is still plenty of demand for the traditional sedan. Which is doubtless why Mercedes has released the new A35 and CLA35. But which one looks better? We break the models down to see if there's a clear winner. Both cars wear a very similar grille but their headlights are quite different. The CLA35's lights are taller and more rounded while the A35's are skinnier and more aggressive to our eyes. We can only spot a few other differences including more details on the A35's lower grille and added bulges on the CLA35's hood. We prefer the skinnier headlights and cleaner look of the A35 compared to the muscular CLA35. The biggest difference between the A35 and CLA35 is their side profiles. The A35 is taller in the rear, allowing for more headroom while the CLA35 slopes down more aggressively, compromising headroom. Even though the CLA35's coupe roofline is supposed to look sportier, we prefer the classic three-box styling of the A35 and wouldn't want to sacrifice rear-seat headroom in an already small vehicle. It's time for the CLA35 to win back some points because its design really comes alive when you get to the rear end. The A35's taillights are more rounded and give off a friendly, unthreatening vibe. The CLA35's taillights are skinny and angular, making the car look far more aggressive. If there is any noticeable difference between the interiors of these two cars, we didn't spot it. This round ends in a tie. In terms of performance, there's very little in it. 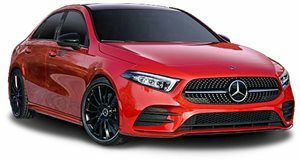 Both the A35 and CLA35 are powered by a 2.0-liter turbocharged four-cylinder sending 302 horsepower and 295 lb-ft of torque to 4Matic AWD through a seven-speed dual-clutch transmission. Thanks to its streamlined bodywork, the CLA35 is a tenth quicker to 60 mph at 4.6 seconds so it gains the slight edge in acceleration. 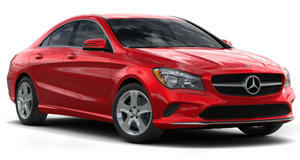 Mercedes has yet to announce pricing for both cars but we expect the CLA35 to be a bit more expensive than the A35. With two wins each and one tie between them, we'll use pricing as our final category and give the overall win to the A35.